The Open edX project is a web-based platform for creating, delivering, and analyzing online courses. It is the software that powers edx.org and many other online education sites. This page explains the architecture of the platform at a high level, without getting into too many details. There are a handful of major components in the Open edX project. Where possible, these communicate using stable, documented APIs. The centerpiece of the Open edX architecture is edx-platform, which contains the learning management and course authoring applications (LMS and Studio, respectively). This service is supported by a collection of other autonomous web services called independently deployed applications (IDAs). Over time, edX plans to break out more of the existing edx-platform functions into new IDAs. This strategy will help manage the complexity of the edx-platform code base to make it as easy as possible for developers to approach and contribute to the project. Almost all of the server-side code in the Open edX project is in Python, with Django as the web application framework. The LMS is the most visible part of the Open edX project. Learners take courses using the LMS. The LMS also provides an instructor dashboard that users who have the Admin or Staff role can access by selecting Instructor. The LMS uses a number of data stores. Courses are stored in MongoDB, with videos served from YouTube or Amazon S3. Per-learner data is stored in MySQL. As learners move through courses and interact with them, events are published to the analytics pipeline for collection, analysis, and reporting. The Open edX project provides a simple front page for browsing courses. The edx.org site has a separate home page and course discovery site that is not open source. Open edX courses are composed of units called XBlocks. Anyone can write new XBlocks, allowing educators and technologists to extend the set of components for their courses. The edX platform also still contains several XModules, the precursors to XBlocks. EdX is working to rewrite the existing XModules as XBlocks and remove XModules from our code base. The LMS is an LTI tool consumer. Course authors can embed LTI tools to integrate other learning tools into an Open edX course. Problems can use embedded Python code to either present the problem or assess the learner’s response. Instructor-written Python code is executed in a secure environment called CodeJail. Courses can be exported and imported using OLX (open learning XML), an XML- based format for courses. Studio is the course authoring environment. Course teams use it to create and update courses. 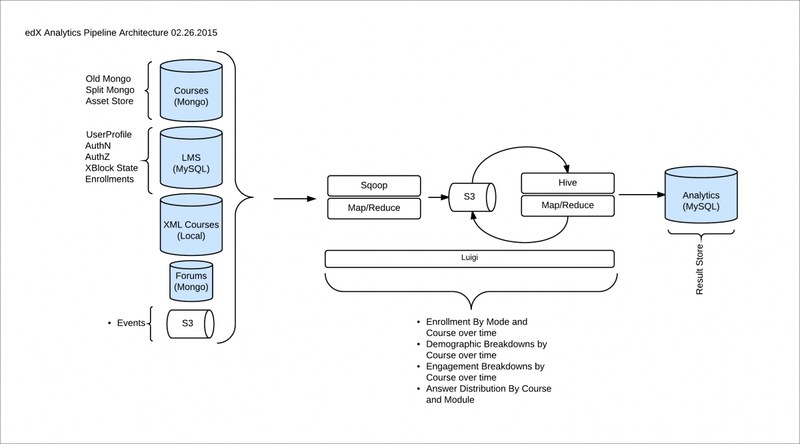 Studio writes its courses to the same Mongo database that the LMS uses. Course discussions are managed by an IDA called comments (also called forums). comments is one of the few non-Python components, written in Ruby using the Sinatra framework. The LMS uses an API provided by the comments service to integrate discussions into the learners’ course experience. The comments service includes a notifier process that sends learners notifications about updates in topics of interest. The Open edX project includes a mobile application, available for iOS and Android, that allows learners to watch course videos and more. EdX is actively enhancing the mobile app. Events describing learner behavior are captured by the Open edX analytics pipeline. The events are stored as JSON in S3, processed using Hadoop, and then digested, aggregated results are published to MySQL. Results are made available via a REST API to Insights, an IDA that instructors and administrators use to explore data that lets them know what their learners are doing and how their courses are being used. The Open edX project includes an IDA called XQueue that can run custom graders. These are separate processes that run compute-intensive assessments of learners’ work. The Open edX project uses Elasticsearch for searching in multiple contexts, including course search and the comments service. In addition to the components detailed above, the Open edX project also has services for other capabilities, such as one that manages e-commerce functions like order work flows and coupons.